The Tanzanian government had plans to establish a 1,500sq km (579sq mile) wildlife corridor around the national park for a Dubai-based company which offers hunting packages for wealthy tourists from the UAE. The plan would have displaced about 30,000 people, and caused ecological problems for the Maasai community, which depends on the seasonal grasses there to rear livestock. But the country's president tweeted in 2014 that an eviction would not take place, after more than two million people signed a petition against the action. 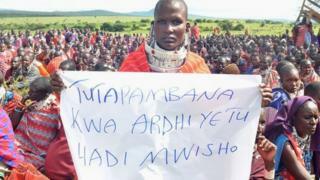 However reported incidents of destruction of Maasai sites persisted. The chairman of Ololosokwani village, Kerry Dukunyi, has told the BBC that villagers have lost property in the latest incident. "A large percentage of our food has been destroyed. We've lost a lot of food," he said. "A lot of our livestock are also missing." It's the latest example in East Africa of the growing tensions between wildlife conservation, which attracts tourists, and the need for locals to have pastoral land, especially during droughts. Earlier this year, Prime Minister Kassim Majaliwa formed a commission to investigate the dispute but its report is yet to be made public.